This chapter is a continuation of an investigation on deterministic spatiotemporal chaos real-time control by means of selected evolutionary techniques. Real-time like behavior is specially defined and simulated with spatiotemporal chaos model based on mutually nonlineary joined n equations, so called Coupled Map Lattices. 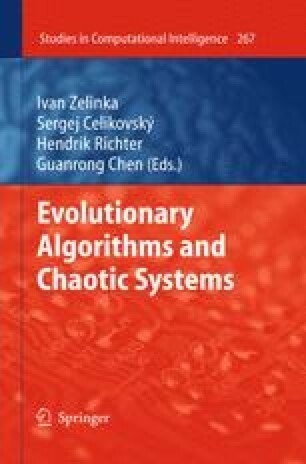 In total five evolutionary algorithms has been used for chaos control: differential evolution, self-organizingmigrating algorithm, genetic algorithm, simulated annealing and evolutionary strategies in a total of 15 versions. For modeling of spatiotemporal chaos behavior, the so called coupled map lattices were used based on logistic equation to generate chaos. The main aim of this investigation was to show that evolutionary algorithms, under certain conditions, are capable of controlling of CML deterministic chaos, when the cost function is properly defined alongside the parameters of selected evolutionary algorithms. Investigation consists of four different case studies with increasing simulation complexity. For all algorithms each simulation was evaluated 100 times in order to show and check robustness of used methods. All data were processed and used in order to get summarized results and graphs.